Excellent gameplay especially on-horse shooting. Superb sound and voice acting. Lots of cool wild west weapons. Lots of blood, gore, and extreme violence. Good variety of side missions. Epic wild west "movie" you star in. Horses are extremely cool and fun. Short main storyline: 8 hours to complete. 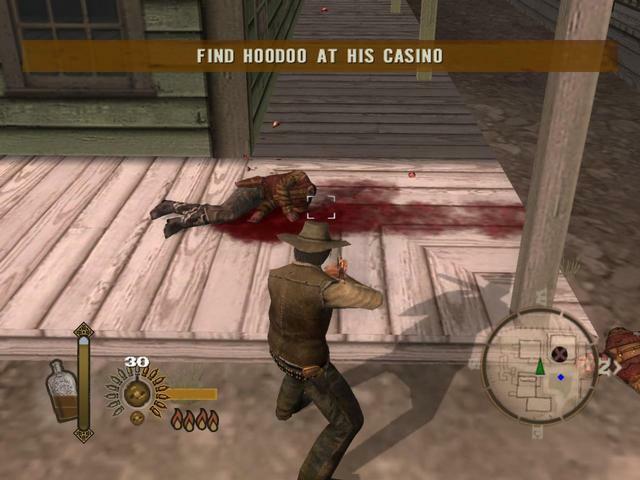 A strong, story driven third and first person shooter set in the wild, wild west! 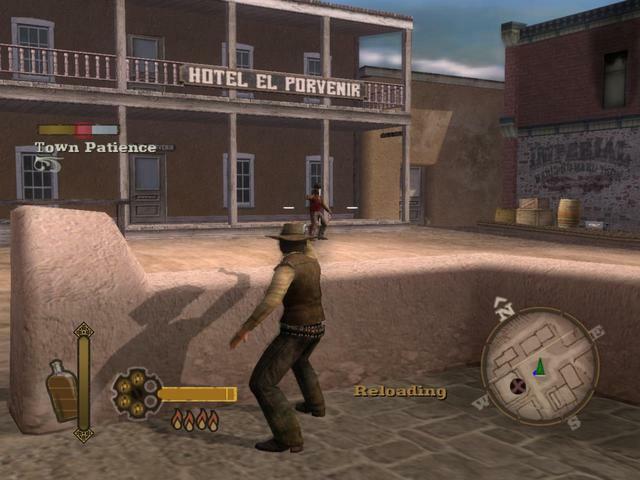 GUN does what many have dreamed about a video game doing for a long time - namely, putting the player in the role of a gunslinger hero in the starring role of their own western movie. As the protagonist Colton White, you will be the star of an epic tale about the lust of power and revenge in the old wild west. With a strong story line that really keeps you glued to the screen, as well as an open-ended side quest system, GUN offers a great, but somewhat short gameplay experience. GUN is primarily played out in the third person point of view. 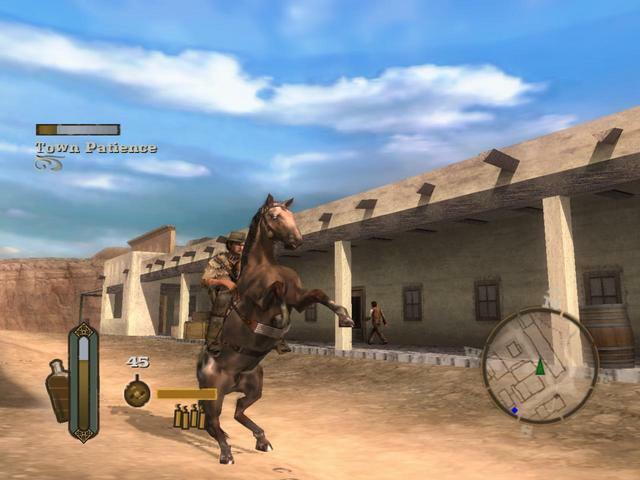 While riding around on your horse or on foot, you will see your avatar Colton White on screen. However, when you aim with the rifle or use the Quick Draw mode for your pistols, it switches into a first person point of view for more accurate aiming. The aiming is actually pretty intuitive, even in the third person mode. In fact, even when you're on horseback, the aiming is pretty easy to get used to, and you'll find that fighting while mounted can be a big advantage, since you will not get damaged as badly if you're on horse. Plus, you can use the horse itself as a weapon by trampling on-foot enemies. The control scheme for GUN on the PC is not entirely intuitive, but it is fully customizable using the options menu if you find it too difficult to use. There are a lot of different buttons to use, such as the WASD keys for movement, the Z key to zoom in for aiming with the rifle, the C key for Quick Draw mode with the pistol, F for grabbing people and optionally executing them with your melee weapon, shift key to stay low and use cover or stealth mode, the G key to guzzle down some health-bar refreshing concoction from your canteen, and more. The Quick-draw mode is one of the coolest features of the game. When you press C it's like time stops for everyone and everything except for Colton's gun arm. You can quickly aim and shoot multiple targets with extreme accuracy in the blink of an eye. The game even has hot keys to switch to different targets while in this mode (A and D switch targets when in Quick-draw mode). You can only use quick-draw for a limited time before your quick-draw meter runs out. The meter refills by making special shots in normal mode firing, such as head shots, shooting weapons out of the hands of the bad guys, or doing multi-opponent combo kills rapidly. In GUN there are some RPG elements, since you have stats like horse handling, melee skill, gun play, and even health. As you complete missions your stats will go up, making it a good idea to complete some of the many side quests in between the major story missions. You can also earn money, which can be used to purchase upgrades for your weapons and other bonuses. It's really a good idea to do as many of the side missions as you can in between the main story quests so that you can do the main story missions, which tend to be much harder, without having to replay a lot. There are a number of different types of side quests you can do in GUN. You can sign on with the local law enforcement to protect the peace. You can also read the wanted signs and take on the role of bounty hunter, hunting down the criminal element and bringing them in, dead or alive. There is a series of Texas Hold'em poker tournaments, which you can participate in for extra cash. You can be a ranch hand, rounding up cattle, a miner, hunting for gold, or a member of the pony express, taking packages as quickly as possible from one spot to the next. In between missions you are free to explore the game world. At first there's not a lot of places you can go, but once you make it to the second town, Empire, the game world opens up. While it's nowhere near as big as the world of GTA: San Andreas, it's still pretty open with a lot to explore. Doing the side missions is a good way to see a lot of the land. You can save your game in between missions, and even during the missions you can usually just hit the Retry button and not have to repeat very much of the mission at all. The lack of save points was not really a problem. 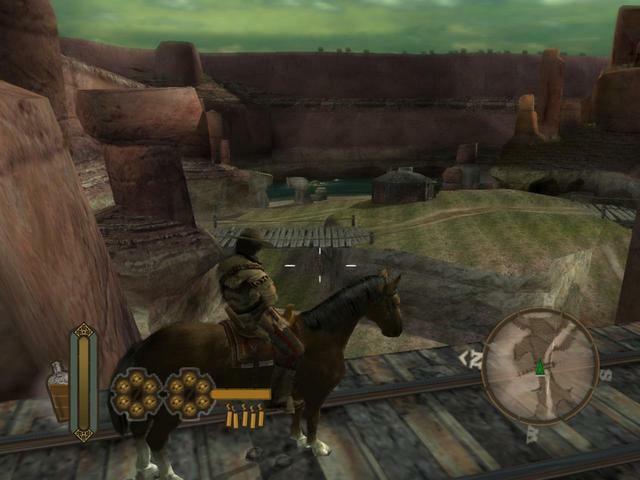 The graphics in GUN are very well done and really do make you feel like you're in a western movie. The wind blows dust around you, your horse kicks up the dust when riding, tumbleweeds blow past you on the plains, not to mention the fire, smoke, blood, and gore of the intensely violent gunfights. The default graphics options are low resolution, so be sure and turn up all the eye candy before you begin playing using the options menu. Sound effects are amazing in gun, the weapons sound realistic and very satisfying, and the environmental effects are good. The music for GUN is a moving orchestral piece that sounds like something out of an epic wild west movie. But best of all is the voice acting, with top name talent like Kris Kristofferson, Tom Skerrit, Brad Dourif, Ron Pearlman, and Thomas Jane as the protagonist Colton White. All of the voice acting is top notch and really makes you feel like you're the lead role in your own western movie. 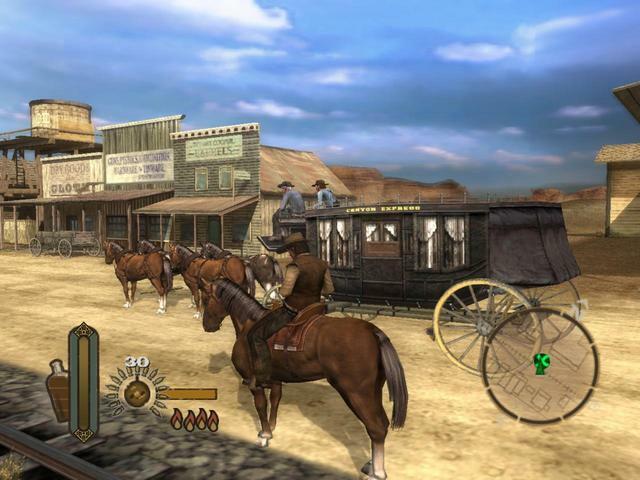 In short, if you're a fan of action games, and the wild west, you NEED to get this game. It is short, with only 8 hours to complete the main mission, maybe 10 if you do all the side quests, but the ride is so, so sweet, and well worth the price of admission. Even new comers to the action genre will find GUN accommodating, since the easy mode is very easy and the difficulty of the game ramps up gradually as you play. Veterans of action games might want to play the game on hard mode to start with rather than on normal, since even normal will pose little challenge to an expert except perhaps for the final boss fight.